Look at Me!! I got married!! Not really. Just kidding about me getting married! Kira came to visit again. She came all the way down from Portland, Oregon to see me! It would be easy to conclude that we got married, but that would not be correct. 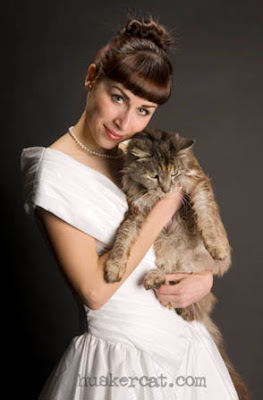 Although she loves me lots, she has her own cat and, besides, people don't marry cats! There no church that would get behind that! Just sayin' One thing is for sure ... Kira would be a lovely bride if she were getting married! She's coming back in June. Stay tuned for more pics of her and me! !